Explore our full range of carpet, area rug and flooring services. Wall-to-Wall & Custom Installations for Residential, Commercial, & Marine. Our carpets are measured on-site, and we provide options in Templating, Renderings, Serging, Wide Binding, Leather Binding, Vinyl Binding, Hand Carved, Hand Tufted, Tapestry Inlay, Fringe, Micro-Bevel, Custom Shaped. We provide on-site custom templating and installation for curved, rounded, & flaring staircases. Whether it is a Runner or Wall-to-Wall on either marble or wood, we measure and provide Templating on-site, as well as options of Renderings, Serging, Wide Binding, Leather Binding, Vinyl Binding, and rugs that are Hand Carved, Hand Tufted, or have a Tapestry Inlay. We sell ready made area rugs from some of the most popular mills that are available in a wide variety of styles and come in standard sizes and colors. Varieties of ready-made rugs include Traditional, Contemporary, Transitional, Tufted Wool, Shag, Hand-Knotted, Tibetans, and Sisal Indoor/Outdoor. Our on-staff graphic artist is available for custom area rug drawings, renderings, & designs. In addition, our showroom is available for design consultations. We have a wide selection of materials of different colors & textures from the latest mill selections. 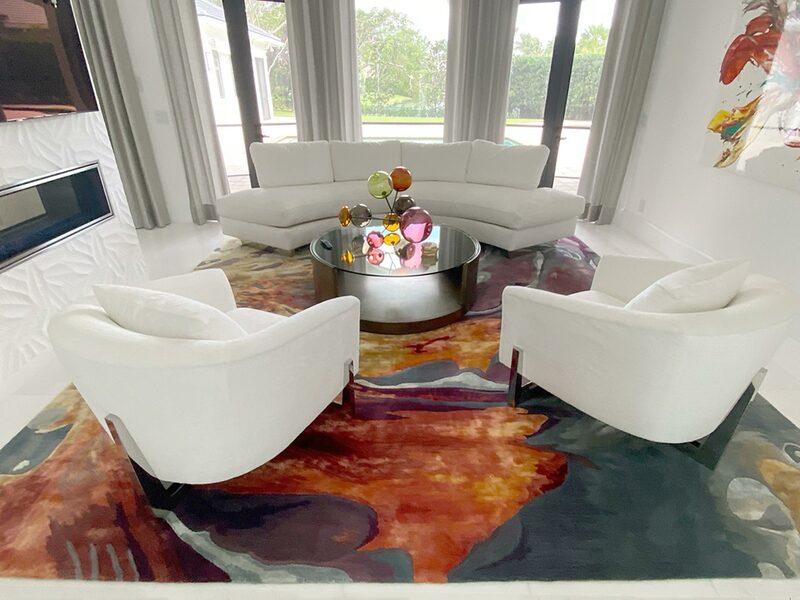 We provide Templating and Renderings for custom rugs, as well as the options of Serging, Hand Binding, Wide Binding, Leather Binding, Vinyl Binding, Hand Carved, Hand Tufted, Custom Shaped and Tapestry Inlay. Sample tile of the approved area rug design. We aren't just limited to carpet! We have a variety of hard flooring options installed by our certified hard-surface installers. We install Hardwood, Cork, Laminate, Engineered Wood, Sheet Goods, Bamboo, VCT, Rubber, and Vinyl Wood Planking (LVT). As part of our installation services we take measurements on-site and provide templating & renderings to demonstrate what any completed rugs, carpet, or hard flooring will look like. Serging, Wide Binding, Leather Binding, Vinyl Binding, Hand Carved, Hand Tufted, Tapestry Inlay, Fringe, Micro-Bevel, Custom Shaped. We provide inspection services certified by the IICRC, meant to determine where responsibility for defects or damage of installed carpet or rugs lies. Customize your corporate workspace with company logos available for Inlays on Area & Entry Rugs. If you have an idea of what you'd like designed, whether it be sketches or just a rough description, our graphic designers provide design services that can make these a reality for your next carpet or rug.